Our crop of Parsnips has started to come in and if you are like many of our CSA members, you scratch your head at the sight of these oblong, white, carrot-esque veggies. 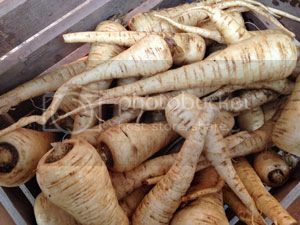 Parsnips have a wonderful sweet and nutty flavor and are truly delectable! They can be used in many ways (they are as versatile as the carrot) and they are a great addition to any kitchen. Preparing parsnips is a very simple process and identical to carrots. Wash them down, use a grater to remove the skin and get cooking! Cooked either by themselves or as part of a vegetable medley, parsnips really come alive when roasted. Chop into bite-size pieces and toss with other vegetables (carrots, onions, peppers & sweet potatoes all work great!) before roasting. You can season them according to your palate, but when in doubt a drizzling of melted butter is a surefire way to go. For something sweeter try maple syrup! Parsnips go great in crock-pot dishes, stews, and casseroles. A cooked parsnip has a similar consistency to a carrot, but the flavor is nuttier and really stands out in a mixture. It’s best to use larger parsnips for stews, diced into medium-sized cubes. One of my personal favorite ways to eat parsnips is to throw them into a pot pie. Yum! It must be the chill in the air, but in the fall it seems like soups become all the rage. When it comes to vegetable bisques winter squash usually steal the limelight, but even here parsnips can shine! Roast your parsnips as you would normally (make sure they don’t burn!) and when they’ve reached a nice brown color puree them in an immersion blender with a vegetable or meat broth. Lastly, combine the puree with some heavy cream and cook a bit longer for a creamy, hearty soup! A perhaps surprising use for parsnips is to combine them with potatoes in a mash. Dice the parsnips as you would for a stew and throw them in to boil with your cubed potatoes. Both vegetables should cook to tenderness in the same amount of time. Prepare them in whatever fashion you prefer to make your mashed potatoes and prepare to experience a tasty twist on a classic dish! Do you have any tips for preparing parsnips? Recipes of your own? Comment below and share your wisdom!